Master & Commander (2003) A hit with the critics and multiple Oscar nominee (including Best Picture and Weir's fourth Best Director gong). Whilst only a middling commercial success (making further adaptations of the series unlikely), picture nonetheless retains a strong following amongst lovers of the novels and stands as one of the finest examples of its genre. The Truman Show (1998) After a long hiatus, Weir returns with his most commercially successful film. Praised as a masterpiece by more sources than I can count, the story of one man's life as the unknowing star of a 24 hour tv series virtually anticipated the 'reality television' craze that was to follow. Fearless (1993) Though well-received by critics, this tale of a man who walks away from a plane crash with an entirely new outlook on life failed to do well at the box office. A mesmerizing film filled with haunting scenes and a finale that can tear you to pieces. This movie just keeps getting better with each viewing. Green Card (1990) Perhaps Weir's "lightest" movie. Many accused him of turning completely Hollywood with this film, but beneath this tale of a marriage of convenience that proves to be anything but convenient, is a lot more magic and insight than you will see in the typical Hollywood fluff in this genre. Dead Poets Society (1989) Although Robin Williams had several serious roles before this one, DPS opened viewers' eyes to just how good an actor he really is. Williams stars as John Keating, an unorthodox professor at Welton Academy who inspires his students to seize the day. Excellent acting and directing make this one of Weir's best. The Mosquito Coast (1986) After Witness, people expected great things with this re-teaming of Ford and Weir. Most did not expect this. Ford plays Allie Fox, a genius inventor who becomes fed up with the U.S. and drags his family to Central America to create his own utopia. Widely panned by critics and a rare box office flop for Ford, this intelligent film, which contains one of Ford's best performances, deserves much more notice. Witness (1985) The film that first brought Weir to the attention of most Americans. He took what could have been a simple mystery thriller and turned it into something much more. Harrison Ford showed he doesn't need a blaster or a whip at his side to draw an audience as he plays a cop who must hide out with the Amish. A beautiful, lyrical film that deals with the clash between two dramatically different cultures. The Year of Living Dangerously (1983) Weir made the daring choice of casting a woman (Linda Hunt) in the role of the dwarf Billy Kwan and it certainly paid off. Hunt won an Oscar for her memorable portrayal of a mysterious man who guides a naive reporter assigned to Indonesia during political upheaval. Gallipoli(1981) Weir's World War I masterpiece. A young Mel Gibson co-stars in this story of two runners whose destinies lie on the bloody battlefields at Gallipoli. By focusing this story on only two characters and spending far more time on their friendship than on the war, Weir creates a devastating film that shows the utter waste of war. The Plumber (1980) Made for Australian television, this is the bizarre story of a woman who finds her life turned upside down when a plumber comes to "fix" her bathroom and proceeds to make him self at home. The Last Wave (1977) Peter Weir explores the mysterious realms of the aboriginals in this intriguing film. Richard Chamberlain stars as a lawyer who becomes involved in defending an aborigine and soons finds himself getting in way over his head. 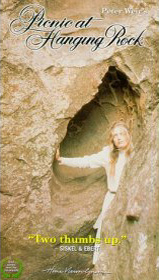 Picnic at Hanging Rock (1975) Weir's second feature put him on the map as a truly talented director. An eerie, beautifully photographed film based on Joan Lindsay's novel of a group of girls who disappear during an outing. Not recommended for people who like their mysteries all perfectly solved by the time the end credits roll. The Cars That Ate Paris (1974) Peter Weir's first full-length feature does not seem to show much of what was in store for the rest of his career. A black comedy about a town in Australia (not France) whose main source of income comes from not-so-accidental car accidents. Homesdale(1971) One of Weir's earliest efforts. A 50 minute b&w black comedy about a bizarre summer retreat where the guests and staff seem to be unusually obsessed with death. A peculiar film that improves on successive viewings. all films directed by Peter Weir unless otherwise noted. "Heart, Head and Hand" (1979) : A 20 minute documentary. "Scenes from the life and work of potter Peter Rushforth. This film shows how Rushforth's philosophy and strong belief in craft as a way of life has reached all those with whom he had been in contact, and the respect and admiration in which he is held both personally and professionally by students, colleagues and friends." "Luke's Kingdom" (1976) : Australian mini-series consisting of 13 episodes. Peter Weir directed at least one of the episodes. "Whatever Happened to Green Valley" (1973) : "Green Valley, a Housing Commission estate 25 miles west of Sydney, has been subjected to harsh criticism over the years by sections of the media. Supplied with Film Australia equipment, the residents were invited to show themselves and their daily lives. The core of the film is the work of half a dozen Valley residents who selected the subject matter, filmed it, and supervised its editing." Peter Weir coordinated the project and also chaired the debate at the end of the film. "The Aunty Jack Show (1973) : An Australian television comedy series. Peter Weir was one of the writers. The Aunty Jack Page, The Golden Glove. "The Fifth Facade" (1973) : A 30 minute documentary on the construction and official opening of the Sydney Opera House. Peter Weir was the screenwriter. "Australian Colour Diary No. 43: Three Directions in Australian Pop Music" (1972) : An 11 minute documentary short for Film Australia. "Offers a sample of three trends in recent Australian pop music: the theatrical act of Wendy Saddington and Teardrop; the jug music of the Captain Matchbox Whoopee Band; and the popular rock group Indelible Murtceps. "Incredible Floridas" (1972) : 10 minute documentary short for Film Australia. "Incredible Floridas is composer Richard Meale's homage to the French poet, Arthur Rimbaud. Scored for woodwind, percussion and string instruments, it was written for the "Fires of London" and their conductor, Peter Maxwell Davies, and premiered in London in 1971 to a enthusiastic reception. Richard Meale is a leader in contemporary music in Australia." "Boat Builders": 5 minute teaching aid. "The Billiard Room" (1972) : A 47 minute teaching aid film. "Designed to promote group discussion on the problems of the adult learning process in management-staff relations through a discussion between a potential university dropout, his friend and an onlooker. It suggests that not all learning occurs in the classroom." "The Computer Centre": 6 minute teaching aid. "The Country Couldn't Do Without You": 7 minute teaching aid. "Field Day" : 5 minute teaching aid. "Tempo: Australia in the 70's" (1971) : A 25 minute documentary directed by Keith Gow and co-written by Peter Weir. "Impressions of life and industry in Australia, emphasising growth and development. The emphasis is on the great potential for growth and economic development in the 1970's." "Three to Go" (1969) : Trilogy of stories. The 28 minute "Michael" episode was directed by Peter Weir. "Part of a trilogy concerning the problems of young people in Australia. Michael has to make decisions in the complex but permissive world of today. His friends have followed a relatively straight and narrow path of conformity. Michael has more or less taken this course, but knows that other ways exist. He is prepared to listen to the prophets of change and revolution and is taken on an excursion into the world of the young radical. In which world does Michael belong?" "The Life and Flight of Reverend Buckshotte" (1968) : a spoof of cult religions with Weir playing the title role. "Count Vim's Last Exercise" (1967) : 16 minute B&W film.